ForeFlight Graphical Briefing is a comprehensive briefing with content derived from approved government sources. 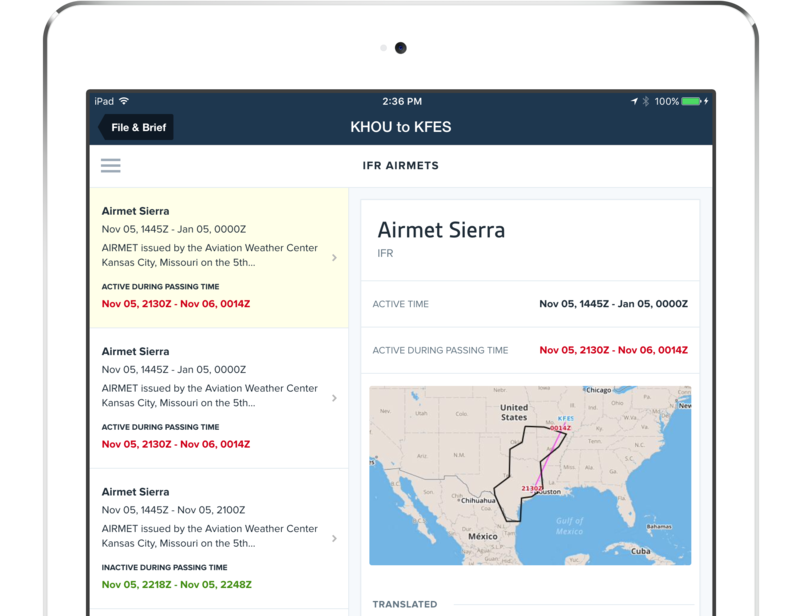 It includes all the elements of a standard preflight briefing prescribed by the FAA—adverse conditions, synopsis, current conditions, enroute and destination forecasts, NOTAMs, and more—delivered in a visually elegant design for enhanced readability. With this next generation briefing format, we believe you will enjoy and get more from the preflight briefing. The Graphical Briefing is seamlessly integrated into the ForeFlight Mobile app and is presented in clearly organized sections, making it simple to tap through each element of the briefing in a logical sequence. Translated and raw text options are available, as well as full-color graphics, which help you better understand and consume briefing information. Also, colored dots used in conjunction with METARs and TAFs give you an at-a-glance view of current and forecast weather. In the first screenshot, green represents VFR, blue is marginal VFR, red is IFR, and magenta is low IFR. The briefing is mobile and portable—once the briefing is retrieved, you do not need an Internet connection to access it again on the go. You can also view the briefing on any web browser by clicking the link in your confirmation email after you file your flight plan. 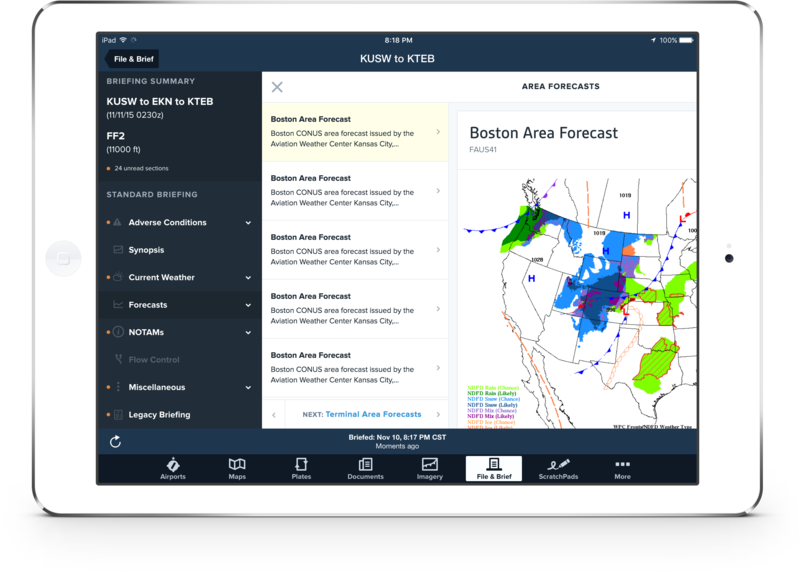 In addition, Graphical Briefings are timestamped and stored on your iPad and iPhone, and in the ForeFlight cloud, to record that you obtained weather and pertinent NOTAMs in compliant manner with 14 CFR 91.103(a) preflight action. Graphical Briefing is available to all customers with ForeFlight Mobile 7.4 and beyond on both the iPad and iPhone. You can enable the briefing at any time by going to More > Settings > File & Brief, and tapping the ForeFlight Briefing slider so that it turns blue.